Homepage. 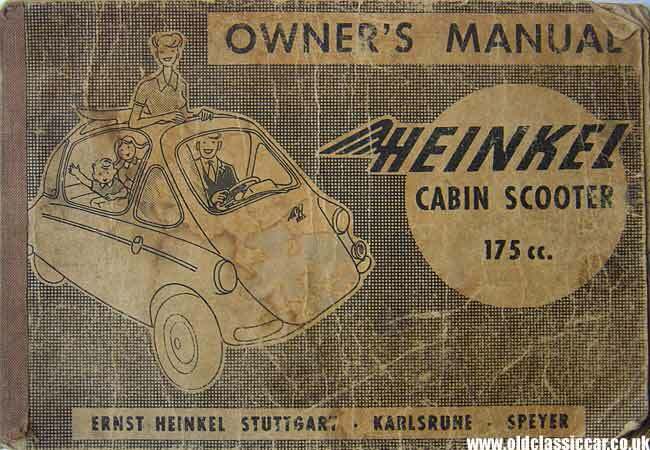 This page: The classic Heinkel 3 wheeler from Stuttgart. The Heinkel 'bubble car' was built between 1955 and 1964, a classic time for all fans of bubble cars. Heinkels, and the British-built Trojan, were originally designed as a cheap and economical runabout, one ideally suited to negotiating and parking in busy city centres, where long distance cruising ability and comfort was not really an issue. These were the days before the BMC Mini, when your hard-up motorist had to make do with a moped or scooter for an economical means of transport. The advent of curious little bubble cars gave the cash-strapped wannabee car-owner a new option, one with a roof over their head to keep the elements out. Many motorcyclists switched to running a 3 wheeler, and retired their biking leathers to the garden shed. The Mini's success in the early 60s certainly did for bubble sales in the UK, and these micro-cars, from manufacturers such as Messerschmitt, Heinkel, Trojan, BMW (Isetta) and many less-well known makers, gradually disappeared from our roads. The golden age of three wheelers was all but over, their memory being kept alive today by the enthusiastic actions of dedicated bubble car fans around the world. mighty surprised when I stumbled across this battered old handbook at a car boot sale, still tucked away in a tatty old envelope. The envelope has the remains of an address on it, for the London Chamber of Commerce, and looks like it too dates to the 1960s at the latest. It would seem then that whoever owned this manual, and indeed an example of the 3 wheeler Cabin Scooter, worked for quite a prestigious employer in the capital. The condition of this handbook is poor, but it was evidently a cheaply-produced publication in the first place, being printed as it was on very low-grade paper. 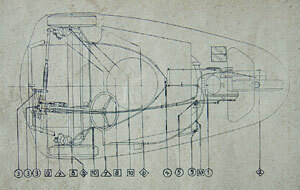 The cover features the best illustration of this classic little Heinkel (an aircraft manufacturer, don't forget). It shows a cheery driver, two chirpy children in the capacious rear compartment, and his blond fraulein stood looking out of the fold-back sunroof. The manufacturer's address is given too - Ernst Heinkel - Stuttgart - Karlsruhe - Speyer (in Germany, of course). Heinkels and Trojans were built at various plants across the globe, located in Germany, England, Ireland and even Argentina. Other information of use includes the fact that it comes fitted with a Pallas carburettor (with details of needles etc), gearbox info (4 speed plus reverse), top speed is 86 kmh (56 mph). Fuel consumption at 40mph equates to 94 mpg!! For more information specific to Heinkels, I'd recommend having a look at a specialist website, such as that for the Heinkel-Trojan Club. To advertise for parts, try the Heinkel 3 wheeler page in the classifieds section here at oldclassiccar, its free to use, so it might be worth listing any spares 'wants' or items you have for sale on here.